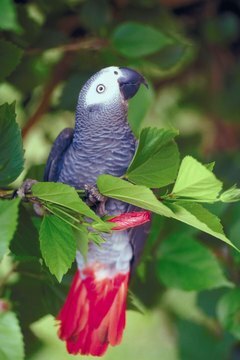 Determine the gender of your African gray. Determining the gender of your African gray parrot is pretty simple, although if you intend to breed or show your bird you will need DNA sexing done by a veterinarian. Sexing on your own should not be done until your bird is at least 18 months old. Grasp the bird firmly in your hand and flip him over so that you have a clear view of the underside of his tail feathers. Look closely at the undertail covert feathers. These are the smaller feathers directly under the tail feathers. Look for gray edging on the ends of the red feather. If gray edging is seen, your bird is a female. Male birds will either have solid red feathers or white edging at the ends of the feathers. Can You Put Two African Gray Parrots in the Same Cage? What Is a Good Snack for an African Gray?